Like it or not, Manitobans are now subject to a carbon tax — and its effects will be felt at the gas pump, on your heating bill and beyond. As of April 1, the federal government imposed the new levy on four provinces — including Manitoba — that didn't meet Ottawa's demand to introduce their own carbon pricing systems. 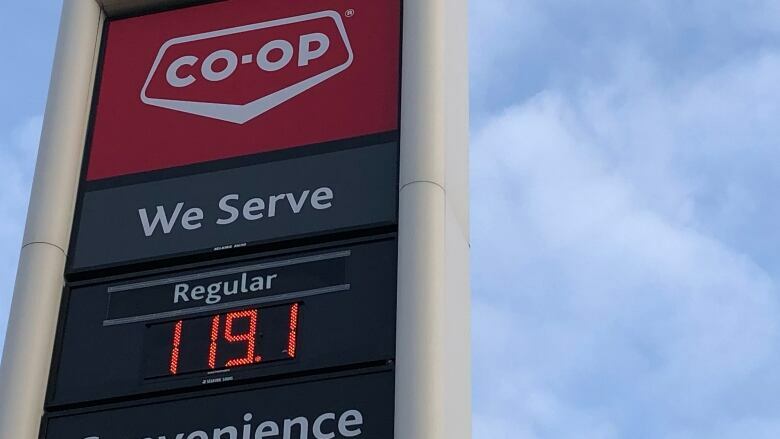 The carbon tax is now being charged on 21 different fuel inputs in Saskatchewan, Manitoba, Ontario and New Brunswick, including gasoline, at an initial rate of $20 per tonne of carbon emissions. That will gradually rise to $50 per tonne by 2022. It means new up-front costs when Manitobans fill up their gas tanks and heat their homes, but the federal government says 70 per cent of people will actually receive more money back through a rebate than they'll pay in carbon-tax related expenses. "It won't be a large increase on any individual thing, but in aggregate it could have a significant impact, especially for lower-income households," said Jennifer Winter, a University of Calgary economist whose examined the price tag attached with a carbon tax. Effective now, the price of gasoline will rise by around 4.42 cents a litre. The federal government has estimated gasoline prices will increase by roughly 11 cents per litre by 2022. 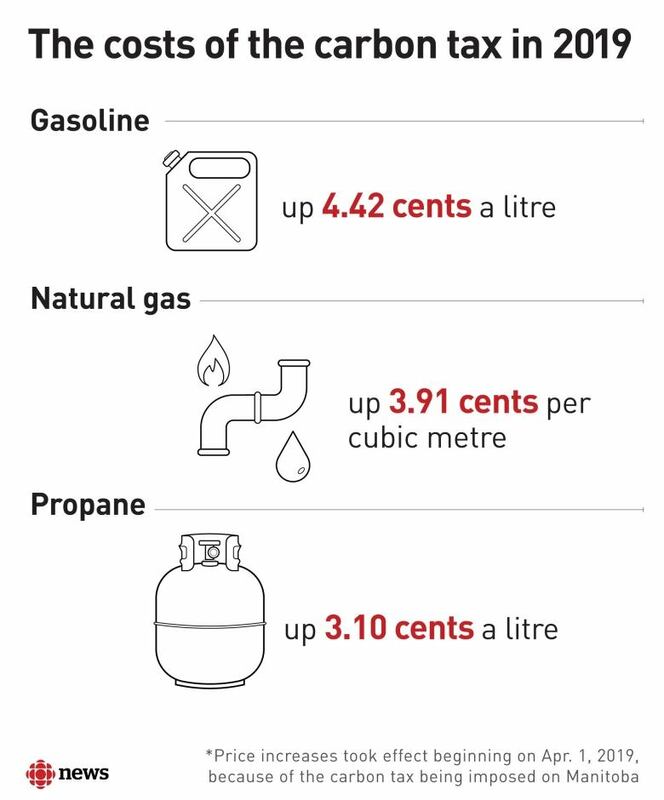 Natural gas will go up 3.91 cents per cubic metre and propane 3.1 cents a litre. The federal carbon charge will add around 13 per cent, or $88 a year, to the natural gas costs of a typical household, Manitoba Hydro estimates. But the federal government says most Canadians will actually pocket more money than they spend under the tax, thanks to a carbon tax rebate — which Manitobans can claim beginning with their 2018 tax filings. Every Manitoban who files their taxes receives the rebate — regardless of income or how much they spend on fuel or natural gas. Broken down, the rebate for this year is $170 for a single adult or the first adult in a couple, $85 for the second adult in a couple, and $42 for each child in a family. 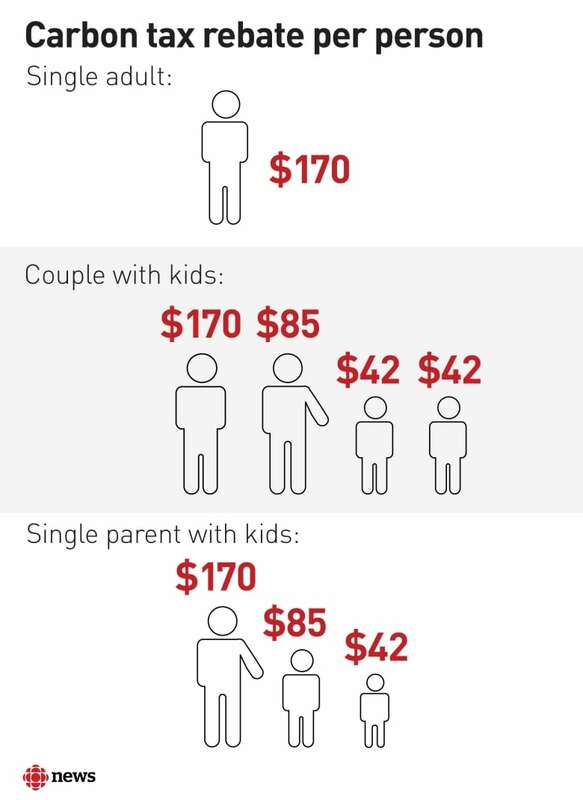 Single parents will be remitted $85 for their first child, and $42 for every other child. 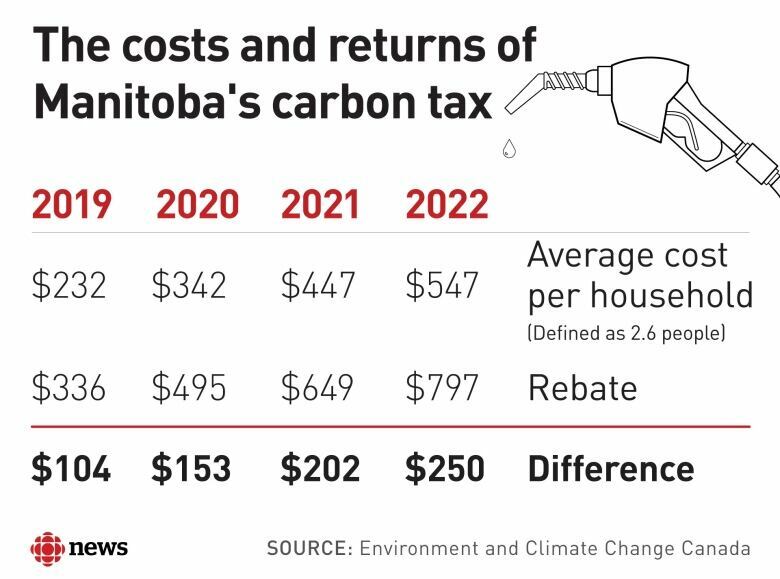 According to the federal government's estimates, the average household in Manitoba will pay $232 in extra carbon tax-related costs in 2019 — but receive a rebate of $336. That rebate will also grow as the carbon price increases. Ottawa says it intends to return all proceeds it collects from Manitobans. Ninety per cent of carbon tax revenue will go to consumers, while the remaining 10 per cent — estimated at $190 million over the next five years — will support schools, hospitals, businesses, non-profits, Indigenous communities and post-secondary institutions, the federal government says. Winter, who pegged the carbon-tax cost to an average Manitoba household at $273 in 2019, calls the carbon tax an incentive program. It will encourage some to change their behaviours — which Justin Trudeau's Liberal government says is the intent. "It is going to have an influence on emissions in Manitoba," Winter said. She acknowledges some businesses are upset they currently have to bear carbon tax costs, but aren't entitled to rebates. The federal government has promised details on carbon tax support for small and medium-sized businesses, and provided estimates on what those supports will be, but has not provided firm details. For now, the federal government's rationale is that it has to change mindsets at the individual level. "We want the burden to fall on consumers, so that they're changing their consumption decisions," she said. "In many ways, it's a tough argument to accept." Manitoba Premier Brian Pallister remains a critic of Ottawa's escalating carbon tax. He pitched a flat $25 per tonne pricing scheme but withdrew the plan last October when Prime Minister Justin Trudeau wasn't satisfied. "My reservations remain. I think it's an inopportune effort," Pallister said, arguing the federal plan "accelerates the tax withdrawal." He's still lobbying Ottawa for a better plan, he said. Large industry emitters will report on their emissions annually and have the option to purchase credits or carbon offsets, or pay the federal carbon tax. As for the agriculture sector, it will have some relief, as the carbon tax isn't applied to farm fuel. Tristin Tergesen, who lives in Gimli, Man., and is retail manager of the gift store at the Canadian Museum for Human Rights in Winnipeg, spends more than two hours on the road every weekday. She tops up her gas tank three times a week, usually spending $20 each time. 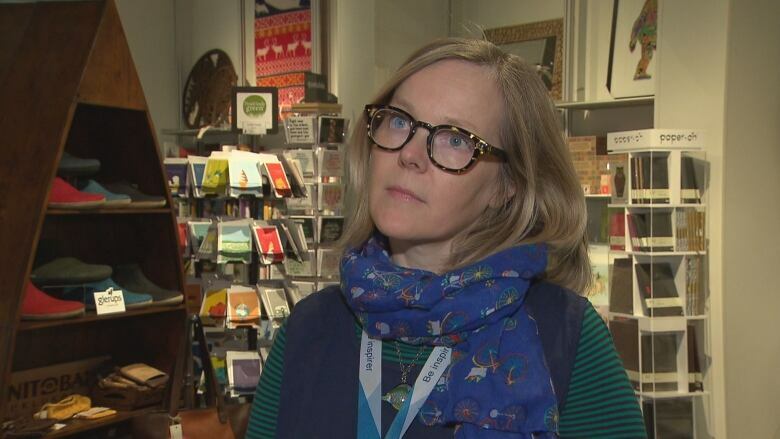 "I don't love it, but I'm not going to change my routine immediately," she said of her response to the carbon tax. "I might look for other options, other alternatives for myself to try and save money," Tergesen added, referring to efforts like carpooling. At Lacoste Garden Centre, co-owner Jordan Hiebert said his Winnipeg business tried heating less space in their greenhouse during certain periods to cut back on emissions and costs. They'll keep at it, even if they get the rebate the feds are offering greenhouses, which can face tens of thousands of dollars in heating costs a month. "We're conscious of our environment," he said. "We want to be part of the solution."